iOS 4.2 for iPad changes the functionality of physical hardware switch on the side of iPad, where it previously acts as iPad screen orientation lock and allows user to lock the orientation of iPad, useful when users are reading ebooks or watching videos in various posture. Now, the physical switch serves as a mute switch, whereas an alternative virtual orientation lock button is used to lock the orientation instead. Hacker has managed to hack the iPad running on iOS 4.2 to change and revert the functionality of the side hardware switch back to orientation lock as in iOS 3.2.2. The hack comes in the form of application which is installable through Cydia store. NoMute is a utility available via the BigBoss repository in the Cydia app store. 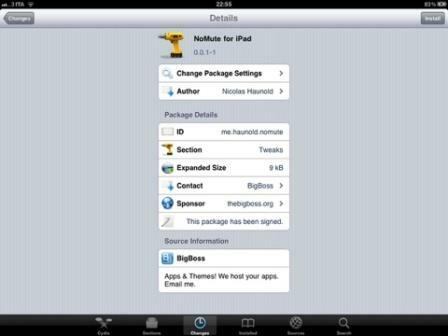 As such, user has to jailbreak iPad to install NoMute. NoMute allows users to quickly and easily change the iPad mute switch back to an screen orientation lock switch, reverting the iPad buttons functionality back to original state.